The musky octopus, Eledone moschata, be-longs to the medium size octopus of Octopodidae and is a commercially important species in coastal countries of Mediterranean Region (FAO, 2003). This species inhabits muddy bottoms at depths between 8-400 m throughout the Mediter-ranean Sea as well as the Sea of Marmara, Ae-gean and Adriatic Seas and the Gulf of Cadiz (Digby, 1949; Mangold-Wirz, 1963; Roper et al., 1984; Katağan and Kocataş, 1990; D’Onghia et al., 1991; Tursi and D’Onghia, 1992; Salman et al., 1997; Akyol and Metin, 2001; Salman et al., 2002; Silva et al., 2004; Akyol et al., 2007; Akyol and Şen, 2008). Musky octopuses are usu-ally discarded by the Turkish bottom-trawlers because of its low commercial values. There are scarce studies on the diet and feed-ing activities of E. moschata. Boletzky (1975) stated that juveniles of E. moschata consume the small pieces of shrimp (Leander spp.) and crab (Carcinus maenas) or live crabs (C. maenas, Philocheras spp. ), while molluscs (bivalves and gastropods) and fishes are generally rejected. On the soft sandy and muddy bottoms where E. mo-schata lives, crustaceans are various and abun-dant; it seems likely, therefore, that they are the main food items as in the related species E. cirr-hosa (Mangold, 1987). Şen (2007) reported that the musky octopuses showed significant prefe-rences amongst food items in this order: crusta-cean > molluscs > fish. Also, there is only one study on diet of E. moschata in the natural envi-ronment (Krstulović Šifner and Vrgoč, 2009). They notified that in nature E. moschata fed mainly with crustaceans (65%), fish (37.8%) and cephalopods (21.8%) according to their stomach contents. However, there is no study on diet and feeding of the musky octopus in the Aegean Sea. The aim of the present study is to determine the feeding of the musky octopus from its natural ha-bitats. Monthly samples of Eledone moschata from bottom trawl net (18 mm stretched mesh) catches at depths between 30–78 m during one hour sur-vey. The survey was done using R/V ‘Egesuf’ (27 m length and 500 hp engine) from December 2004 to November 2005, except in February, July and October in the Bay of Izmir, northeastern Aegean. A total of 471 specimens were measured and fully or partially full stomachs were fixed in 6% formaldehyde, and analyzed in the labora-tory. 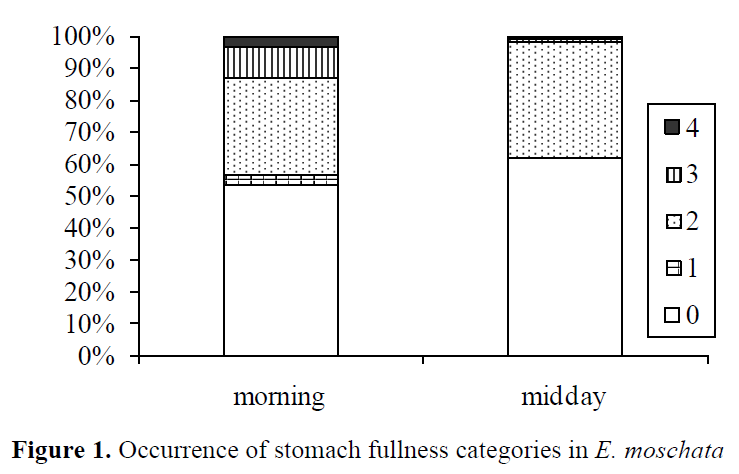 The degree of stomach fullness was esti-mated from 471 individuals whose capture times were precisely known (369 stomachs at 09:00 in morning; 102 stomachs at 12:00 in midday). The following Zuev et al. (1985)’s scale of the sto-mach fullness was used: 0, empty; 1, traces of food; 2, filled less than half; 3, filled more than half; 4, full; 5, exclusively crammed, its walls distended (Laptikhovsky, 2002). The importance of stomach fullness according to the two diurnal times was evaluated calculating the index of sto-mach fullness (ISF = total stomach contents weight / total octopus body weight * 100) (Hys-lop, 1980). Chi-square test (χ2) was used for comparisons of stomach fullness between morn-ing and midday periods. A total of 53 out of 210 stomachs (fully or partially full) were examined. Stomach contents were examined microscopically and prey catego-ries were identified in higher taxonomic level. Crustaceans were recognized by diagnostic ex-oskeleton fragments, extremities and eyes. Bony fishes were determined by otoliths. Total body weights (BW) and dorsal mantle lengths (ML) of Eledone moschata were meas-ured in fresh animals to the nearest ± 1 mm and ± 0.01 g, respectively. The averages were given with standard errors (± SE). In this study, 267 females and 204 males of Eledone moschata were between 2.7 cm ML (3.4 g of body weight) and 15 cm ML (651 g of body weight) with an average of 7.9 ± 0.09 cm ML (121.9 ± 4.5 g of average body weight) in both sexes. A total of 369 and 102 stomachs were ob-tained from morning and midday samples, re-spectively. The stomach fullness category (5) was not observed, while the stomach fullness category (1) was only detected in the morning group. Al-though, the empty stomachs (0) in the morning and in the midday were found as 53.7% and 61.8%, respectively, the full stomachs (4) were estimated as 3.3% and 1% for the same times (Figure 1). Indexes of the stomach fullness (ISF) for morning and midday were calculated as 0.187 and 0.161, respectively. There were significant differences between morning and midday stom-ach contents (P<0.05). Analysis of stomach contents showed that the musky octopus fed principally on crustaceans and the others were found with crustacean remnants (Table 1.). Surprisingly, multifilament net yarn (Figure 2) and spine of sea urchin were found for the first time in a stomach of E. moschata. Despite the limited number of samples exam-ined, results indicated that E. moschata fed al-most exclusively on crustaceans, fish, gastropods and bivalves. The diet of E. moschata, reported in the current study, is similar to the previous stud-ies of this species (Şen 2007; Krstulovic´ Šifner and Vrgoč, 2009). There were differences in stomach fullness of E. moschata between the morning and the midday periods. Krstulovic´ Šifner and Vrgoč (2009) re-ported that important prey categories of the larger specimens were crustaceans, fish and cephalo-pods, and also they observed cannibalism. Alt-hough, in this study crustaceans and fish were major preys, neither cephalopods nor cannibalism were observed. In the present study, especially small crusta-ceans were eaten completely; these findings are parallel to results of Krstulovic´ Šifner and Vrgoč (2009). On the contrary, Şen (2007) reported that the musky octopus eat soft parts of the crusta-ceans and discharged exoskeletons in controlled conditions. However, it’s known that many octo-pus species change their feeding behavior de-pending on the size and life conditions (Guerra, 1978; Boucher-Rodoni et al., 1987; Nixon, 1987; Hanlon and Messenger, 1996). 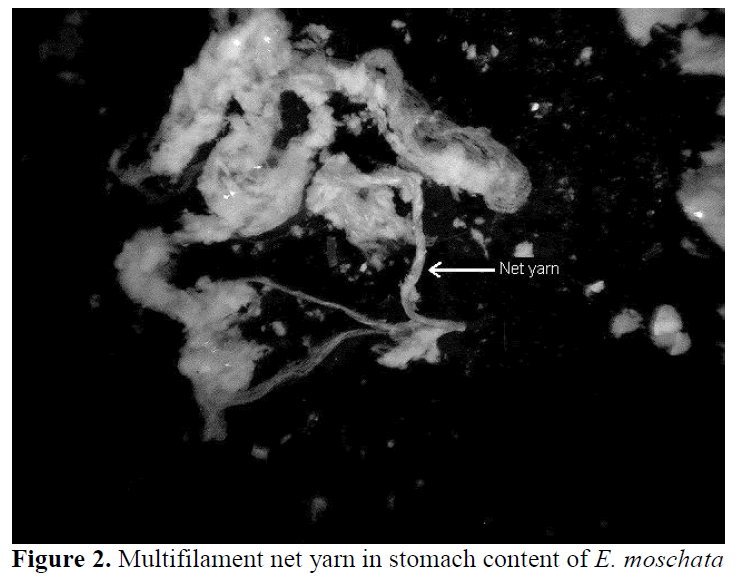 Additionally, the finding of multifilament net yarn in the stomach is the evidence of the opportunistic behavior of E. moschata, eaten the fish entangled to the com-mercial gill net. In conclusion, according to the present results, E. moschata fed almost exclusively on crusta-ceans, fish, gastropods and bivalves. There were differences in stomach fullness of E. moschata between the morning and the midday periods. It seems that these animals feed probably at dusk as there were many empty stomachs of E. moschata. They are opportunistic animals able to change their feeding behaviors. So, the further and more detailed studies on diurnal and seasonal feeding habits of E. moschata in the Aegean Sea with determination of prey at lower taxonomic levels are needed. Akyol, O., Metin, G., (2001). İzmir Körfezi'nden (EgeDenizi) Dip TrolüyleAvlananBazıKafadanbacaklı (Cephalopoda) TürleriveOrtalama Av MiktarlarıÜzerineAraştır-malar, AnadoluÜniversitesiBilimveTeknolojiDergisi, 2(2): 381-385. Akyol, O., Şen, H., (2008). A new maximum size for Eledonemoschata (Cephalopoda: Octo-podidae), Journal of Marine Biodiversity Records, 1(e71): 1. Boucher-Rodoni, R., Bouchard-Camou, E., Mamgold, K., (1987). Feeding and diges-tion. In: Boyle, P.R. (Ed. ), Cephalopod life cycles, Volume 2. Academic Press, London, pp. 85–108. Boletzky, S.V., (1975). Le développementd’Eledonemoschata (Mollusca, Cephalop-oda) élevée au laboratorie, Bulletin de la So-ciétézoologique de France, 100: 361-367. Digby, B., (1949). Cephalopods from local wa-ters at the University of Istanbul, Nature, 163: 411. D’Onghia, G., Tursi, A., Papaconstantinou, C., Matarrese, A., (1991). Teuthofauna of the North Aegean Sea: Preliminary result on catch composition and distribution. FAO Fish, Report, No. 477: 69-84. FAO, (2003). Fishery statistics. Catches and landings, FAO Fisheries Series No. 65. FAO Statistics Series No. 175, Vol: 93. Guerra, A., (1978). Sobre la alimentacion y com-portamientoalimentario de Octopus vulga-ris, InvestigacionPesquera, 42: 351-364. Katağan, T., Kocataş, A., (1990). Note prélimi-nairesur les Cephalopodes des aux Tur-quies, Rapport de la Commission İnterna-tional Exploration de la Mer. Mediterranée, 32: 242. Mangold-Wirz, K., (1963). Biologie des Cépha-lopodesbentigues et nectoniques de la Mer Catalane, Vie et Millieu, Suppl. 13: 285. Mangold, K., (1987). Reproduction. In: Boyle, P.R. (Ed.). Cephalopod life cycles, Volume 2. Academic Press, London, pp. 291-305. Nixon, M., (1987). Cephalopod diets. In: Boyle, P.R. (Ed.). Cephalopod life cycles, Volume 2. London: Academic Press, pp. 201–219. Roper, C.F.E, Sweeny, M.J., Nauen, C.E., (1984). FAO Species Catalogue. Cephalo-pods of the Word. An annotated and illus-trated catalogue of species of interest to fi-sheries. FAO Fisheries Synopsis, 3: 277 p.
Salman, A., Katağan, T., Benli, H.A., (1997). Bottom trawl teuthofauna of the Aegean Sea, Archive of Fishery and Marine Re-search, 45: 183-196. Salman, A., Katağan, T., Benli, H.A., (2002). Cephalopod Fauna of the Eastern Mediterra-nean, Turkish Jounal of Zoology, 26: 47-52. Şen, H., (2007). Food preferences of Eledonemoschata Lamarck, 1799 (Cephalopoda: Octopodidae) in captive conditions, Interna-tional Journal of Natural and Engineering Sciences, 1: 29-31. Tursi, A., D’Onghia, G., (1992). Cephalopods of the Ionian Sea (Mediterranean Sea), Oe-balia, 18: 25-43. Zuev, G.V., Nigmatullin, Ch.M., Nikolsky, V.N., (1985). Nectonic Oceanic Squids, Ag-ropromizdat, Moscow, 225 pp. [in Russian].